Aveda Invati Advanced 3 Step System. Condition is New. Dispatched with Royal Mail 2nd Class. BEARD OIL 30ml - NON GREASY, EASILY ABSORBED OIL TO CONDITION BEARD & SKIN WITH A SUBTLE MASCULINE FRAGRANCE. BY MY BEARD SET. Sweet almond oil adds shine to dull hair, a conditioning their structure. Diamonds shine on your hair! Shiny brilliance of diamonds. Diamond Dust and LustreplexTM-cause the hair is full of light, soft and smooth to the touch. 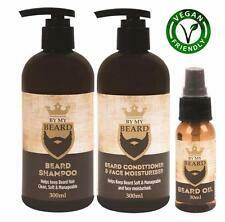 By My Beard Shampoo, Oil, Conditioner & Moisturiser Mens Gift Set - Vegan. Discover Elvive Fibrology, this breakthrough hair care range designed to give thicker looking hair wash after wash. The secret to glossy shine. Shampoo has been used once, Conditioner is new. SHAMPOO 250ml. DOVE HAIR THERAPY PRO-AGE SHAMPOO & CONDITIONER. CONDITIONER 200ML. Expand & thicken hair. 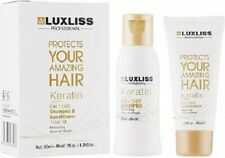 Specially developed with Filloxane, the shampoo formula together with the conditioner, thickens the hair fibres and provides deep cleansing. Penetrate deep within the fibre. The formula remains in the fibre for a long lasting effect. Without Rinsing. Style the hair to obtain the desired hairstyle. Wet Hair : Spray the mask from a distance of about 20cm. Comb to evenly distribute the product on the hair. Proceed to styling. Do not rinse. HERBAL ESSENCES WHITE TEA MINT 400ML SHAMPOO & 400ML CONDITIONER. This daily detox system is gentle enough for daily use and safe for colour treated hair. Shampoo - large 400 ml bottle - Lightweight Shine Shampoo. Against yellowness. 1x Swiss-o-Par Silver Shampoo against yellowness 250 ml / 8.4 fl oz. 1x Swiss-o-Par Silver Conditioner against yellowness 250 ml / 8.4 fl oz. The Swiss-o-Par Silver Hair Conditioner was specially developed for gray or bleached hair. Shampoo: apply it to damp hair, massage in, then rinse out. Mask: apply it to cleansed damp hair for 2-3 minutes, massage in and thoroughly rinse out. Gently cleanses, repairs and hydrates hair. 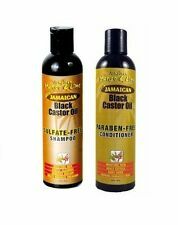 Strengthens hair roots, boosts its growth and prevents the appearance of dandruff. 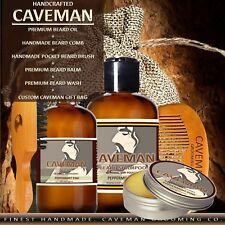 Non greasy, easily absorbed oil to condition beard and skin with subtle masculine fragrance. BE MY BEARD OIL 30ML. We are based in Manchester since 2014. Blended from the finest natural ingredients to breast a conditioning oil that is absorbed quickly to condition the hair and skin. OGX VANILLA & CHAI SPICE SHAMPOO & CONDITIONER SET. 2 X 385ML BOTTLES - 1 SHAMPOO & 1 CONDITIONER. 250ml Each. Kemon Liding Life Kroma Saver Shampoo. 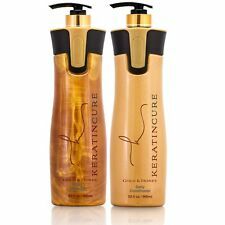 Colour saving shampoo - 8.5 FL OZ 250ML size. Kemon Liding Life Kroma Saver Balm. Protects colour, preventing it from becoming dull. Enriched with natural green tea extract, phytokerin and selected UV screens. Tigi Bed Head Urban Antidotes Re-Energize Tween Shampoo & Conditioner Duo 750ml. 750ml Tigi Bed Head Urban Antidotes Re-energize Shampoo. 750ml Tigi Bed Head Urban Antidotes Re-energize Conditioner. OGX Renewing Argan Oil of Morocco Shampoo, Conditioner & Weightless Reviving Dry Oil Set. A unique blend of Natural & Sulfate Free Surfactants for renewed softness. Avon Advance Techniques Colour Correction Violet Shampoo & Conditioner. Fight colour fade. Health and beauty products do not have an expiry date until opened and used. I can order for you any product from the. Fire up your colour with Herbal Essences Ignite My Colour Shampoo for coloured hair. It replenishes your colour-treated hair and reveals its full radiance. While Moroccan rose and passion fruit nectar surround you with a bright, uplifting scent. Internal capacity:Shampoo 500g & Conditioner 500g. Shampoo 500 g. Conditioner 500 g. Condition: NEW. Kemon Liding Frequence Set. 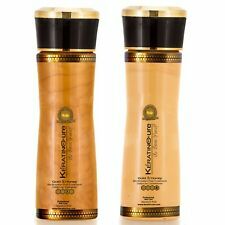 Kemon Liding Frequence Shampoo. Shampoo For Frequent Use - 8.5 FL OZ 250ML size. 5.1 FL OZ 150ML. It relieves dryness of the scalp. It gives back shine, leaves hair easy to manage and feeling silky. The advanced Derma&Pure formula, which is safe for coloured hair, effectively fights Itchy Oily and Dry scalp to Stop dandruff before it even shows. It is specially designed to help maintain the dandruff protection of your head & shoulders shampoo.